We believe that our dogs are our best friends, and that’s why we need a reliable source to turn to for information on all things “dog” in our community. Our mission is to be the number one Charleston area resource for dog owners regarding regional dog-centric and dog-welcoming events, health & wellness information, dog training, trends, and local news. We also strive to be a mouthpiece to the public for various Lowcountry-based pet non-profits, and we promote pet adoption and other responsible pet care practices. Founded in Charleston, South Carolina in 2005 as a print magazine, we re-launched in 2015 as an online publication. In 2016 we have updated our website to continue our mission to be the best dog friendly resource in the Lowcountry. Brian grew up in Atlanta, GA and has always been a dog person. His childhood dog was a mutt from the humane society that he had til he was 17 years old. At 20, while in college he got a chow named Jasmine that changed his life and she was by his side for 15 years. Moving to Charleston in 2002, Brian worked with a local home builder before starting his own market research business. In 2009, after Jasmine had passed away, he adopted Peanut and began working with animal rescues in his spare time. In 2010, he started helping Lowcountry Dog Magazine as their ad executive. In 2015, after LCDM had stopped publishing, he purchased the company from former publisher, Leah England. His goal is to continue to spread the word of dog rescue and be the #1 resource for dog information in our area. Peanut is the reason we are all here. She was originally a stray and rescued by Brian in 2009 when she was 3 years old and had just had a litter of puppies. After adopting Peanut, Brian became actively involved in dog rescue and Lowcountry Dog Magazine. She is not only the boss but an inspiration for everything we do here. Julie Murray has been volunteering in animal rescue for many years. She spends her days as a paralegal and nights and weekends as a rescue mom to her two rescues. Zelda the pitbull and Henry the wookie. 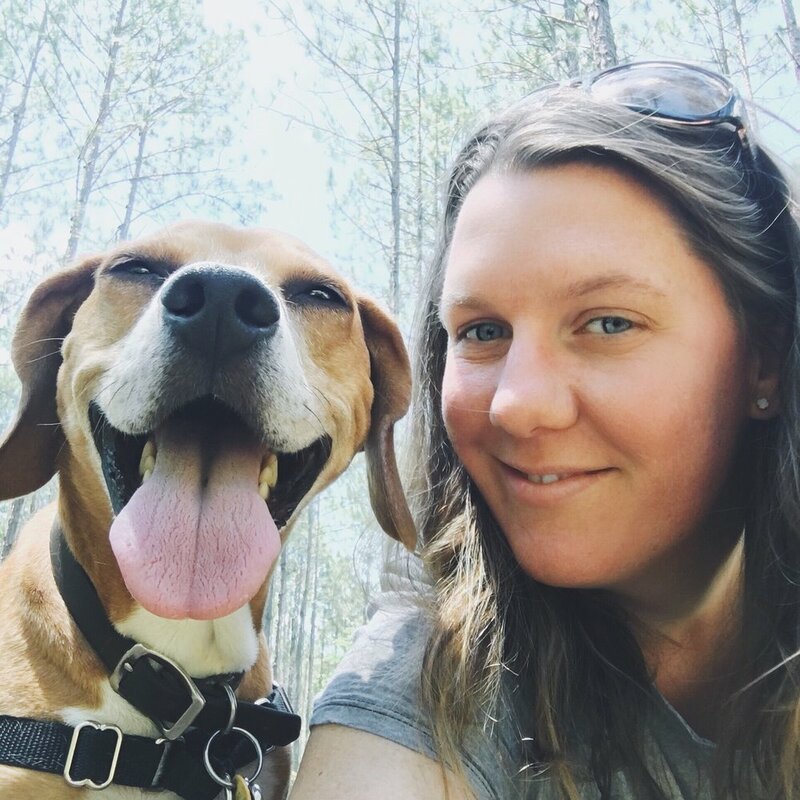 Julie is our head writer as well as coordinating content and our social media presence..
Chelsea actually graced our cover in February of 2016 with her dog Tinkerbell. A graduate of College of Charleston, Chelsea makes sure we look good every issue and our grammar is always on point. You can catch Chelsea behind the bar at Lowcountry Dog HotSpot Garage 75 or hanging out with her two dogs Tinkerbell and Vixy. Abbie is our advertising assistant. She helps small businesses get their name out to the public in our magazine, on our website and through our social media. Abbie lives in Park Circle with her husband and two rescue pups Laela and Mowgli and in September of 2018, she welcomed her son, Oliver Liston to the world. Alicia was born and raised in Charleston and graduated from Clemson University in 2015 with a degree in International Trade. Alicia is the founder of Eunoia Rescue where she has saved over 100 dogs from euthanasia and found them forever homes in her first 2 years as a rescue. Alicia writes our Editorial Column, PEACE, LOVE & REAL TALK as well as helps with story ideas, events and promotions. Kelly was born in New Jersey but found her way to South Carolina by way of Clemson University where she graduated in 2015. She studied Communication and was the Assistant News Editor for The Tiger Newspaper. Kelly is also a personal trainer and lives on Johns Island with her fiance and her two rescues Esso and Dabo. Kelly writes and researches articles for us. Izzy joined the Lowcountry Dog Pack in 2017 and has helped with social media as well as events. She is attending College of Charleston as a Communications Major and is one of of our staff writers as well helping with events and special projects. If you have ever been to a Lowcountry Dog Event you have probably met Julia! Julia helps out of our events. She spends her days working at a local pet boutique and her off time with her two rescues Chowder and Aurora who were in our Oct 2017 Issue PEOPLE OF CHARLESTON. Jackie is the talent behind Southern Vintage Design and Photography who is the talented photographer that make Lowcountry Dog Magazine look so good. Southern Vintage’s beautiful photographs grace our cover each issue as well the main story. They specialize in weddings, family sessions as well as dog photography. Jessie Anderson-Berens is a video producer and owns Palmetto Coast Media, a full service video production company located in Charleston, South Carolina, with clients across the globe. She works a lot with rescues and shoots and produces our Rescue Spotlight videos we do each issue. Jessie is a huge dog lover and produced the docu-reality series GIVE ME SHELTER that aired in over 115 countries in 2014 and 2015 that starred LCDM's own, Brian Foster. Laura Olsen owns A Website in a Week and is a rescue mom to Calliope. You may remember her as the staff photographer for Lowcountry Dog Magazine from 2010 to 2015. Since relocating in 2016, Laura is now our web developer and consultant for the magazine.